Recombinant full length Human CXCL11 expressed in E.coli (O14625). Induced HeLa cell culture supernatant. Our Abpromise guarantee covers the use of ab155936 in the following tested applications. Sandwich ELISA Use a concentration of 1 - 3 µg/ml. 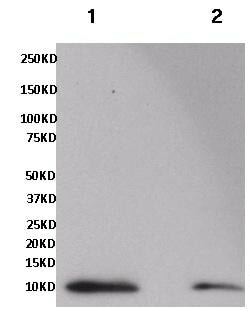 Use as coating antibody at 1μg/ml and 0.125-0.25 μg/ml for detection. Western blot analysis was performed using a 4-20% Tris-HCl polyacrylamide gel. Proteins were transferred to a PVDF membrane, blocked with 5% Milk/TBST for at least 1 and then incubated with ab155936 overnight at 4ºC with rocking. Following washing with TBS/0.1% Tween 20, the membrane was incubated with secondary antibody for at least 1 hour and washed again. Chemiluminescent detection was the performed. Sandwich ELISA analysis of Human CXCL11 was performed using an ELISA Kit by coating a blank 96-well microtiter plate with 100µl per well of ab155936 in duplicate at 1, 3, 4, 5, 7, and 9µg/ml in DPBS and incubating for 12-18 hours at 4C. The plate was aspirated and blocked with 300µl per well of 4% BSA and 5% sucrose in DPBS for 1 hour at room temperature. 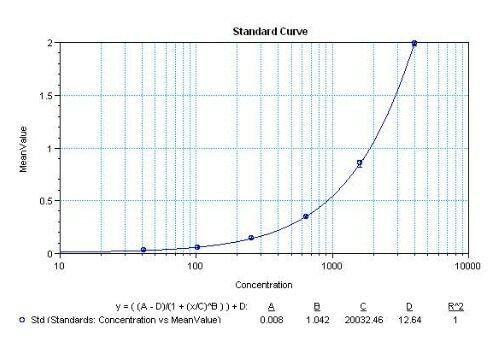 Human CXCL11 recombinant protein at 50µl per well was added in duplicate at 4000, 1600, 640, 256, 102.4, 40.96, and 0 pg/ml for 2 hours at room temperature along with 50µl of a Human CXCL11 biotinylated monoclonal antibody in all applicable wells at 0.2µg/ml for 2 hours at room temperature. The plate was washed and incubated with 100µl per well of Streptavidin-HRP in all test wells at 1:80,000 dilution for 1 hour at room temperature and then washed and incubated with 100µl per well of TMB substrate for 30 minutes at room temperature in the dark. The plate was stopped with 0.16M sulfuric acid. Absorbances were read on a spectrophotometer at 450-550nm. ab155936 has not yet been referenced specifically in any publications. Publishing research using ab155936? Please let us know so that we can cite the reference in this datasheet. There are currently no Customer reviews or Questions for ab155936.